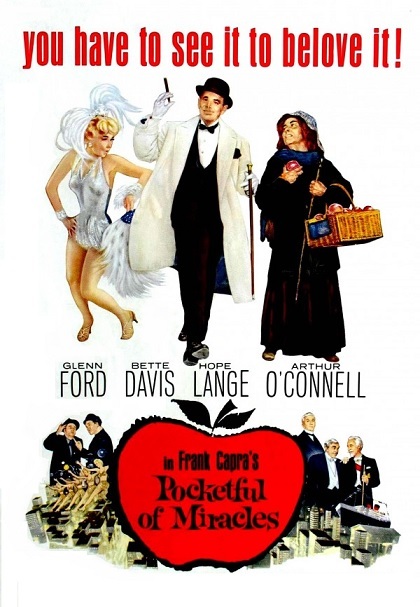 A New York gangster, Dave the Dude (Glenn Ford, A Stolen Life), comes up with an elaborate plan to turn a street vendor, ‘Apple’ Annie (Bette Davis), into a high society lady when she finds out that her daughter, who doesn’t know she’s a street peddler, is coming to visit her. With Pocketful of Miracles, Frank Capra joined an exclusive club of filmmakers — Alfred Hitchcock, Cecil B. DeMille, William Wyler, Leo McCarey, etc. — who made the same movie twice. This remake of Capra’s early hit, the 1933 Pre-Code classic Lady for a Day, is surprisingly good and in some areas surpasses the original. The 1933 movie was an adaptation of Damon Runyon’s short story Madame La Gimp. For whatever reason, director Capra didn’t go back to the source material, instead, he used Robert Riskin’s old script as the basis for the new screenplay. Pocketful of Miracles feels more like a shot-for-shot remake than an updated version of Runyon’s tale — camera angles are nearly identical and most of the dialogue is repeated verbatim. The role of Dude’s girlfriend, played by Hope Lange (Peyton Place), suffers the biggest change; she’s given a background story. Glenn Ford, who co-produced with Capra, was dating Lange at the time of filming, so I wonder if Ford had something to do with enlarging the role. The new additions made the film unnecessarily longer — the remake is nearly 40 minutes longer than the original — but they don’t damage the film too much. Bette Davis is very good as Annie. Davis was dissatisfied with her own performance (she thought the original Annie, May Robson, was unbeatable), but I thought she did a good job. It’s really not a question of who is better, she or Robson, it’s a question of which approach works better. Robson’s Annie has an element of doubt — she’s never sure if the thing can be pulled off — that Davis doesn’t repeat. In the remake, Annie remains hopeful that things will turn out okay. Davis plays Annie as a woman who wants to believe, while Robson played Annie as woman who is consumed by self-doubts. It’s hard to determine if this is about dramatic interpretation or this is just a reflection of different eras: 1930s despondency versus early 1960s optimism. Ford and Lange are the weakest links here. There are not bad, but neither one is believable as an unsophisticated city dweller. Ford and Lange are too clean-cut, too “square” to be believable as gangster and gunmoll respectively. Ford’s role calls for someone like James Cagney or George Raft (Capra’s original choice, Frank Sinatra, would have been perfect). Lange is trying to be Jean Harlow and it doesn’t work. The film’s best moments are provided by the supporting cast. Peter Falk (The Cheap Detective) nearly steals the film as Ford’s main henchman. Thomas Mitchell (Stagecoach), in his final film, is also terrific as the judge enlisted to play Annie’s husband. Arthur O’Connell (Picnic) plays a Spanish aristocrat and Edward Everett Horton (Lost Horizon) is hilarious as a butler. Ann-Margret (film debut) is super-charming as Annie’s daughter. Many familiar faces appear throughout the film: Jack Elam (Rancho Notorious), Ellen Corby (Shane), etc. Here comes the inevitable question: which version is better, Lady for a Day or Pocketful of Miracles? I did like the remake a bit more. It does come down to the cast — the remake has actors that I tend to like more. Yes, Ford and Lange were just okay, and I’m willing to admit that Davis wasn’t as good as Robson, but Falk, Mitchell, O’Connell, and Horton were improvements. Plus Ann-Margret is a bundle of charm. Overall, both movies are fun. Sadly, this was Capra’s swan song, but I thought he ended his career on an appropriately sweet note. Color, 133 minutes, Not Rated. I like this version very much, but need to see the original again. Bette Davis and Ann Margret are a delight, as is the whole supporting cast, but you are right, the Glenn Ford/Hope Lange subplot is tiresome and makes the film overlong. Ford is dynamite in Gilda and a few other films, but is not memorable here as you note! A fave from childhood. Davis is great and Peter Falk hilarious. Falk cracks me up! Very funny indeed! This is one I should have seen! Thanks for another fine review of a lost gem. This movie has given me much joy since l was a child! Of course, l prefer it to the original, because of Bette. The wonderful supporting cast almost stole the show from her, though. I love Capra’s choice of music from the Nutcracker to Boccherini’s Minuet. Thank you for another great review, Eric!